In its annual '5 in 5' predictions, IBM forecasted that in five years, computers will gain the five senses and be able to experience the world as humans do. Some day soon, you'll be able to order a wedding dress on your tablet and feel the fabric and the veil just by touching the screen. When you feel an object, your brain registers the series of vibrations on your skin as being smooth, rough, sharp, etc. Computer sensors are becoming sophisticated enough to do that too. Within the next five years, vibrators within smartphones will be precise enough that they could be designed to mimic the vibrations experienced when your fingers touch a particular surface. Even though you'll just be touching glass, it will feel like you're touching whatever object is displayed on the screen. "We're not talking about fuzzy screens," said Bernie Meyerson, IBM's (IBM) vice president of innovation. "You're not going to have to dry clean your Samsung." 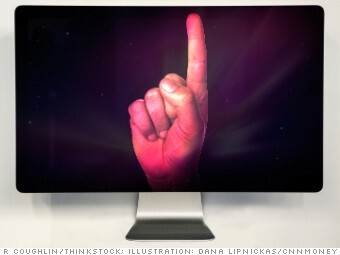 In some ways, computers are already simulating touch -- albeit in a crude form. When you're driving a car in a video game, the controller vibrates when the car starts to veer off the road. It may not feel precisely like a steering wheel's vibrations when you hit gravel, but within five years, that technology is expected to become even more lifelike. IBM's researchers are working on just that -- creating applications for the retail and healthcare sectors that use haptic, infrared or pressure-sensitive technologies to simulate touch.